If you ask any cat owner then they are likely to say that the contented purr of a satisfied kitty is one of the sweetest noises ever! But how can you make sure that you have a happy pet? What are the secrets of established cat owners when it comes to making your kitty happier and healthier? We can let you into the secrets of a happy cat. One of the biggest ways to keep your cat happy and healthy is to encourage play time with them. 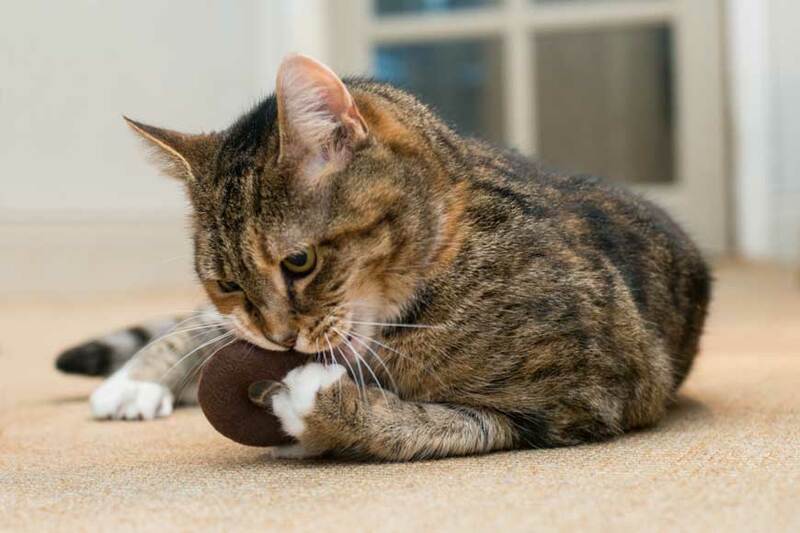 Hunting is a natural instinct for cats so allowing them to indulge in a spot of hunt based play is a great way to keep them happy and entertained. This is why most cat toys will have some element of prey about them; whether it be feathered or furry they are likely to get the attention of your kitty and have them pouncing and stalking in no time. Cats really love fresh food, so it is important, even with dry biscuits that you only put down what you expect your cat to eat in a short space of time. You should try to feed your cat as far away from their litter tray as possible (imagine eating your dinner next to a toilet) and leave them alone whilst they munch away. A mixture of wet food and dry biscuits is the perfect diet for a cat; however if they can only have one or the other this works great for them too! Not every cat wants to roam around their surroundings, but for those cats who are prone to outdoor adventures it is important to try and keep them as safe as you can. Microchipping is a great way to ensure that if anything happens to your cat then you will be notified. Don’t forget the classic alternative to chipping is a simple collar with a tag. Definitely buy a collar that has a quick release mechanism in it so that if your cat does get stuck somewhere the situation won’t be made worse by a snagged collar. Cats, by nature are a clean animal that hate their own mess. That is why it is really important to make sure that you keep their litter tray nice and clean. Scooping the poop and wet litter out of the tray at regular intervals, as well as topping up with fresh litter, is something that every responsible cat owner will do. If you have more than one cat, you should try to have more than one litter tray; cats are known for their joy at sharing the bathroom! They may seem like obvious tips to some, but to new owners these are just the things they need to know in order to have a happy, healthy kitty. Make sure you share with us your cat stories; we love hearing about your precious kitty cats and of course we all know that a happy cat is a happy owner! Get ideas on how to keep your cat happy and healthy. Check out some of the ways we keep out cats happy and healthy with our handy guide. This entry was posted in Behaviour, Cats, Health. Bookmark the permalink.